In the spring time 2011 I took part in several airsoft games near Montreal and I’d like to share my impressions with you. Airsoft is a recreational activity in which participants shoot plastic balls launched via replica firearms… I found out (internet) that this game was created in Japan. The essence of the game to hit your opponent by 6 mm plastic ball which launched as I said via your replica. If you hit your opponent or “enemy player” that player must shout – “I’m hit”, then he wears something red (a cap for example) and after this he/she off the game temporary or not it depends on concrete rules. In most rules, the player who is hit should return to his/her camp as the minimum. But there is big disadvantage and advantage in the same time in this point… There are lot discussions and argues about this moment mostly started by people who haven’t enough experience in the airsoft. You probably know that paintball uses balls with paint i.e. as it called. Airsoft’s ball doesn’t make any mark. So a player just feels hit. Just all! In most cases, you can not check / proof that you hit your opponent. In the other words, the game based on the honesty of participants… Well, you can think who will reveal his / her defeat… 😉 Hmm it is logical. But in practice participant who hides his defeats will be recognized later by other players. Then this cheater will not be invited to other games. So the advantage is that you will play with honest people. As I understood, scenarios could be limited only by an imagination 🙂 Here photos from the game with the scenario: Americans from USA attacked Quebec and we must defend Quebec 😯 Actually it is beyond my imagination. This was extracted by civil people from Toyota. Can you imagine if an uninitiated person sees this? These replicas are very similar to their prototypes. Some of the airsoft’s replicas have the same weight as their prototypes. In the picture below you see a briefing before the game. WOW! Looks like there are soldiers from all kind of forces from different countries. Where from this soldier? We are on a defensive position. Enemies attacked us from different positions at the same time. Well, we lost that position… 🙁 Red tissue on our head means that we are hit. And we went to our camp for a time. Actually, airsoft is some kind of extreme game. Sometimes there are injuries. Look at the picture bellow – do you think this is due hit the ball? No – “He has been run, lost control, hit a tree”. The fight is over. We are wet dirty but happy! Yes, this game connects with using weapon replicas but in spite of this airsoft is not associated with violence. I think this game can relieve stress very effectively. Special thank to Isabelle Fréchette for her photos. 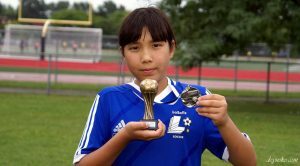 Soccer for girls in Lasalle – Denmark team in action! Girls’ soccer in LaSalle: Italy team in action!